This section is going to be specifically for, you guessed it, PvP guides! In time I will hopefully be able to provide you with links to all of the Warzones they have in the game and explaining in detail how they work and little tips on how to beat them etc etc. Pretty much exactly everything you see in all of my other PvP Guides on my website. Here are some links to my PvP Guides. I just want these to be up here and easy to access for anyone who wants to. The rest of this page will go into detail about the PvP window and how to use it. To get started though let me show you how to even bring up the PvP window and how to enter a PvP game. In the upper right hand side of your screen, where the minimap is you will see two crossed swords. This is the icon you need to click to bring up the Battlegrounds menu. You can also press "P" on your keyboard if you haven't changed any of your default settings. This brings up your PvP window as well. 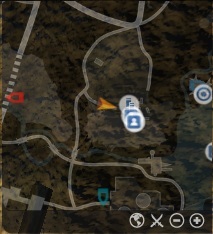 As you can see on the minimap it is the second icon in from the left. Clicking this will bring up the Battlegrounds menu where you will be able to change battlegrounds and check their rewards as well as join a battleground queue, leave a battleground queue and, well that's about it! Since my monitor is so large I am not going to post a whole picture of the BG window but I am going to break it down and explain everything you can do with it. First up the different battlegrounds you can search for. They are El Dorado, Stonehenge and Fusang Projects. Below is a picture of them on the BG list at the top of the PvP window. As you could have guessed all three of these Battlegrounds are drastically different than one another. I'll give you a very brief rundown right here but I will go into indepth guides for each of these battlegrounds later on. Everyone has a central spawn hub and you fight to take/keep control of artifacts to win the game. When one team controls all four of the relics for 2 minutes the game ends. If not it ends after 20 minutes elapses. Awards 12 Black Marks of Venice for a win. Awards 4 Black Marks of Venice for a loss. For this Battleground everyone fights to control the middle. Whomever has the most people standing there the longest wins the game. This one is more deathmatchy than the other one so keep that in mind if you are looking for that sort of gameplay. Awards 12 Black Marks of Venice for a win. Awards 4 Black Marks of Venice for a loss. This is a giant Battleground that never ends. You know those Faction Buffs you have on top of your health bar all the time? This is where they come from. 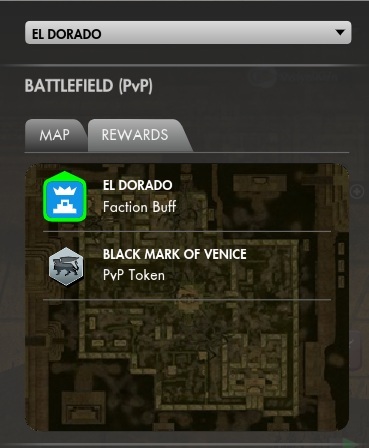 This is also the only Battleground that awards White Marks of Venice. That pretty much sums up those three Battlegrounds right there. As you saw when I mentioned the Battlegrounds I spoke about White Marks of Venice and Black Marks of Venice. You need to know the difference between the two of these marks because they are used in purchasing the PvP gear. I will get into PvP gear in a later guide. Black Marks of Venice you need to earn yourself through El Dorado or Stonehenge but the White Marks you earn through Fusang Projects or just when people do something in Fusang Profjects like capture a facility. It gives the reward to your whole faction. Anyway the main purpose of this part of the guide is to show you the Battlegrounds rewards window which is below this sentence. And then further down the Battleground window you have a nifty feature that shows you what faction is winning whatever Battleground you've selected. Maybe now you can join the underdogs and help them out or join the winning team and bog them down! 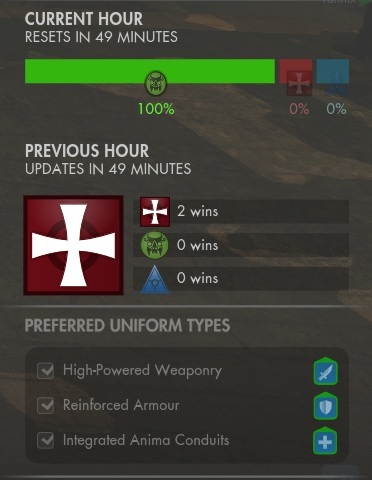 This feature not only shows you who is currently winning but it shows you who was winning the previous hour. A screenshot of it can be found below. All that's left on the PvP window is the join and leave Battlegrounds button. Easy to find and easy to use. Click this whenever you're ready to join and give PvP a try. Good luck and may the force be with you! of wait, that was my other game!